Dave Dobbin, CEO of DAVE Wireless (Data & Audio Visual Enterprises Wireless Inc.) took some time out of building his new network to speak with us. He’s a team player, down right enthusiastic and as says “has the best job in the world”. Do you blame him for being so outspoken about his chosen vocation? I mean he’s coming into a space where there is only 70% penetration and the number of subscribers has increased from 15.0 million in 2004 to 22.1 million in 2008, an average annual growth rate of 10.1%! Plus, a recent study showed that the new entrants will gobble up 8 million subscribers by 2014. It sure sounds like he has many reasons to be ecstatic! 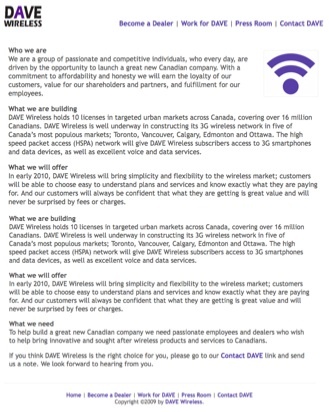 We know DAVE Wireless has major players behind them; names like John Bitove, Paul V. Godfrey (President & CEO of the National Post) and Michael Neuman (President Bell Mobility from 2002 to 2005) are all giving the organization its direction. In addition, they invested $243.1-million for 10 licenses during the Canadian Wireless Spectrum Auction, recently signed a roaming agreement with T-Mobile and brought on Ericsson to design and build their 3G UMTS network in their five most populous markets; Toronto, Vancouver, Calgary, Edmonton and Ottawa. When asked about their anticipated launch date and what the new name will be: “I have consistently said we will be launching our network in early 2010… and we are building a new brand… we want to make sure that we pick a name that resonates with customers, that resonates with employees and it really gives people a feel for what we are doing… I can tell you we are down to a shortlist of names”. He says DAVE Wireless (or the new brand) will be built on 3 pillars: value, simplicity and flexibility. Over the next few months there’s going to be an onslaught of choice for us Canadians… and it’s always best to be prepared to truly understand the people behind the business. Take a few moments and listen to the phone interview and get familiar with this new entrant… as always comment below.